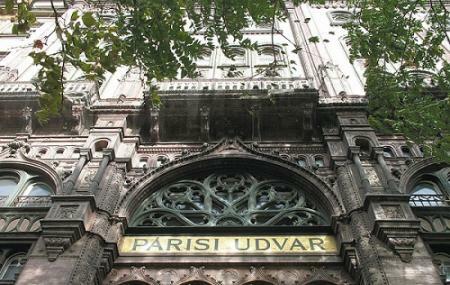 Brudern House also commonly known as Parizsi Udvar is one of the oldest art deco attractions in the city. Today it functions as a Shopping Mall and is frequented equally by locals and tourists. The most amazing part is that it is actually a shopping passage which reflects the marriage of various architectural styles such as Moorish, Venetian Gothic, Art Deco, and Neo Gothic.Started by the Joszef Brothers, this place was initially known as Brudern Haz. After acquiring of the aforementioned place by a corporation and the hiring of a German architect, this place was converted into one of the most beautiful attractions to see. Architecture, specially of the distinct kind is a part of Budapest’s identity and Parizsi Udvar is a must visit to witness old Budapest and its first shopping arcade in its full glory. Public visit is restricted only to the shopping courtyard. For interior visit, special permission is required. You can visit the exterior of the building anytime of the day. Shops have different opening hours. How popular is Parisi Udvar? People normally club together Girl With Her Dog Statue and Budapest Keleti Railway Station while planning their visit to Parisi Udvar. Beautiful building, though currently closed for renovation. For me, one of the most beautiful buildings of Budapest! It is now abandoned and going to be restored into a hotel, but if you are lucky you can find the doors open and check the amazing retro interior inside the passage. You feel like you are in a movie and I hope it will be a nice restoration.